For the past 15 years, Kirk Marketing has been offering a wide range of structural joints and covers. The M.Trim range, for example, accommodates small movement ranges of +5/-5mm and has been successfully used in countless projects where this specification is suitable. The Vexcolt range from the UK, also stocked by Kirk, provides solutions to accommodate seismic movement ranges. The company started to supply the Arfen range of structural joints from Turkey in 2017. This is a one-stop structural joint solution as it offers a complete range of profiles for projects – from parking garages and decks to boardrooms. 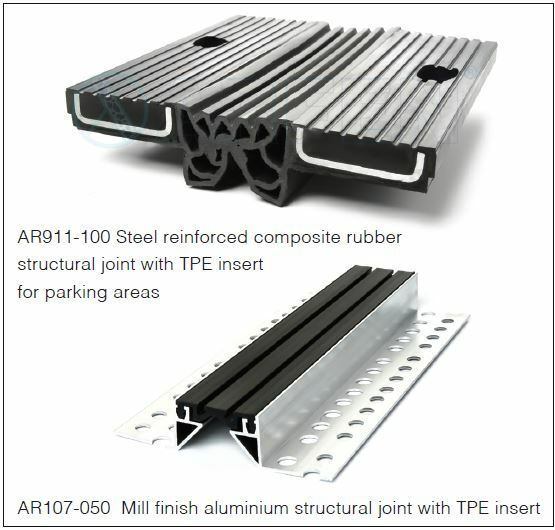 The Arfen range comprises the standard Aluminium and TPE inserts for general foot traffic areas, all aluminium joints for heavy foot traffic and heavy trolley traffic areas as well as specialised profiles for use in parking areas with vehicle traffic. If your project has areas that will receive heavy vehicle traffic, or includes roof decks that need to be waterproofed, consider the AR600 Watertight Expansion Joint. The TPE wings are installed using bitumen sheeting and torch and the wings can be heat welded to provide a permanent waterproof seal. Dilatation Band and epoxy can also be used to waterproof structural gaps. These structural joint ranges mean that Kirk Marketing has a complete solution for contractors and professionals in the built environment. There are products for all structural gap designs and sizes, with profiles that offer movement ranges from 5mm to 50mm. The Kirk specification team are available to assist professionals with advice, technical documentation and support.